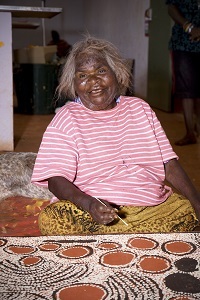 Internationally, Ningura Naparrula is one of the best known of the Pintupi artists. Her work Untitled (Wirrulnga) was selected and translated for an interior in the Musée du Quai Branly, opened in Paris in 2006 – a fine choice for this purpose, as Ningura’s images are characteristically striking in design, especially given the economy of their construction. Not only does the rhythmic power of her gesture inhabit built space with conviction but her regulated palette, consisting of black, white and red-ochre, highlights the essential materiality of architectural practice. The work on offer, Wirrulnga, 2006, is painted into a red-ochre ground, on which black signs are inscribed with generous, open motions. The space is defined with marks derived from sand drawing and Ningura animates each element, outlining its form with confidently applied white dots. The space between each object is then filled with a dotted white field, an approach that can be traced to the mature works of her late husband, YalaYala Gibbs Tjungurrayi (c.1924-1998).1 Critically, Ningura does not overpaint the objects in her works; rather she leaves them blank, enabling the potent intensity of the original red-ochre background to attract the eye. Paradoxically it is these ‘negative’ spaces that read most powerfully, becoming the dominant structural motifs around which subsidiary traces yield and sway. There is a poetic synergy between Ningura’s status as matriarch and the theme of her painting. Wirrulnga is a ‘birthing place’ associated with the Tingari Women who travelled to the site from Kunaputa. 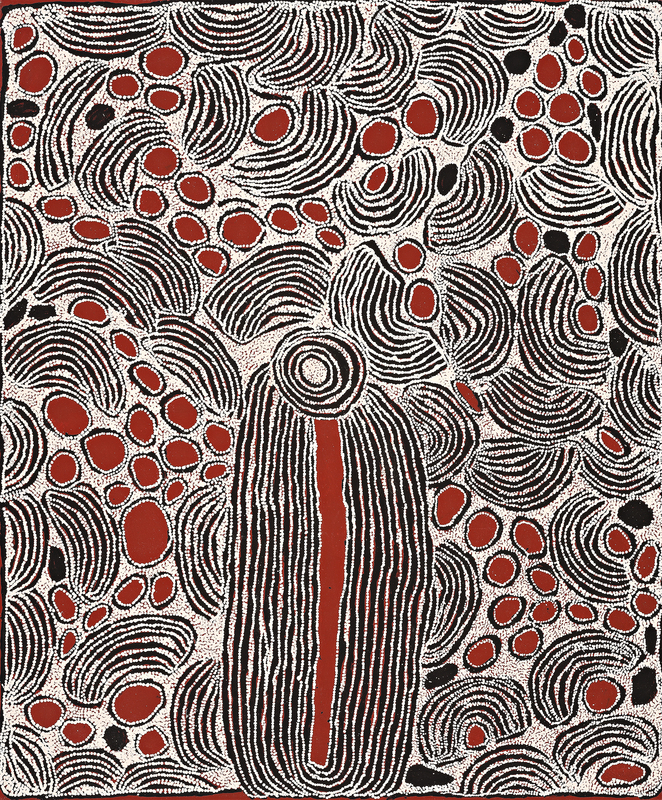 The central form of her painting represents the long flat platform and related waterhole, while the adjacent round objects were used by the Tingari women. The gentle arcs evoke the nyimparra (pubic cover, made with hairstring) worn by the women. Ningurra painted the same site many times during her career, on each occasion revisiting the Wirrulnga with a freshness and intensity appropriate for a site celebrated as a ‘birthing place’. 2. The author’s communications with Vanessa Merlino (née Patterson), 9 September 2016.